Hi everybody, I´m from Barcelona and I have been working in adult schools lately, teaching English, Spanish and Catalan. I am currently working as a language assessor and teacher trainer for the Ministry of Education in Catalonia. I´m really happy to be a member of this incredible community. By the way, I use the Andorran flag because I´m often there and it´s where my parents live. 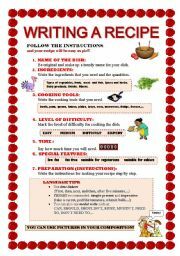 This worksheet is a writing guide for students to do a composition of a recipe. They have to follow the steps before writing the final version. 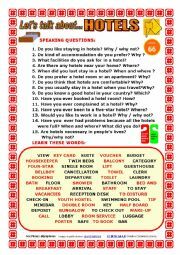 After studying food, quantifiers and cooking utensils, this is good free practice of IMPERATIVE forms, TIME SEQUENCE linkers and some MODAL VERBS.I hope you find it useful. Yummy!!! This is a WRITING GUIDELINE I created for my students to write a film review. 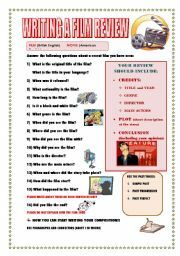 They have to answer some skeleton questions about a film they have recently seen first and then write a composition using the PAST tenses.I hope you find it useful. I prepared a new worksheet to make students talk about the topic of TELEVISION. They can ask and answer the questions in pairs or the teacher can make the questions to the whole class as a warming up activity. Students have to learn some words related to this topic. 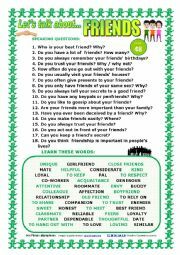 This is a new worksheet to make students talk about the topic of FRIENDS. They can ask and answer the questions in pairs or the teacher can make the questions to the whole class as a warming up activity. Students have to learn some words related to the topic. I hope you find it useful, too. 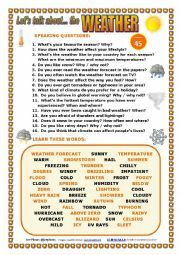 I prepared a new worksheet to make students talk about the topic of the WEATHER. They can ask and answer the questions in pairs or the teacher can make the questions to the whole class as a warming up activity. 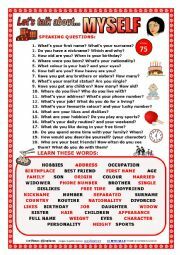 Students have to learn some words related to this topic. It can be used to introduce the SEASONS. 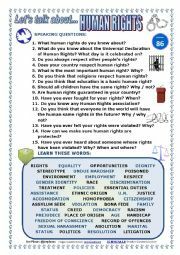 I prepared a new worksheet to make students talk about the topic of WORK. They can ask and answer the questions in pairs or the teacher can make the questions to the whole class as a warming up activity. Students have to learn some words related to this topic. 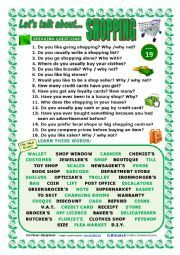 I prepared a new worksheet to make students talk about the topic of SHOPPING. They can ask and answer the questions in pairs or the teacher can make the questions to the whole class as a warming up activity. Students have to learn some words related to this topic.